Since Windows 7 was released, I have had intermittent BSODs when plugging my Garmin Forerunner 305 into its USB cradle. The cause of the issue was always garmnusb.sys. A little searching shows that many users are experiencing the same issue. No one had a solution that worked consistently. Sure, you could connect the Forerunner before booting the PC, but that’s quite inconvenient. A few weeks back, out of curiosity, I tried clicking on the “Update Driver” button for the device within Device Manager. To my surprise, a new driver was available. 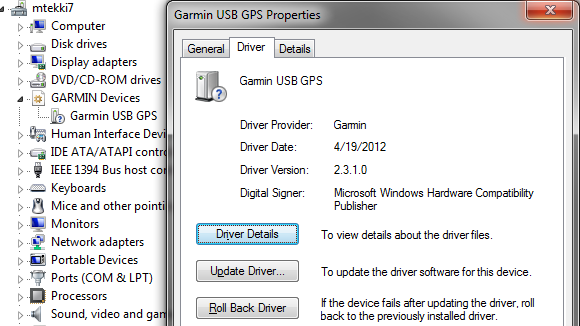 Garmin released version 2.3.1.0 of the driver back in April. Since updating to 2.3.1.0, I have not experienced any BSODs on my system. Going from crashing every other time I connected my Forerunner to zero BSODs is a great improvement. Unfortunately, this is something Garmin should have had fixed three years ago, before Windows 7 was released.